To me this is old school design in flatware. This 65-piece cutlery setting for 12 is intended to be paired with a Royal Albert table setting but most definitely is not required. 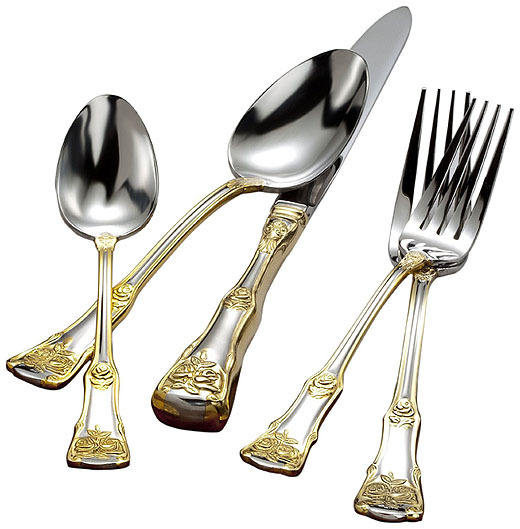 The gold roses are what add that extra flair to the design of this cutlery. I love the look and the price is pretty good too. 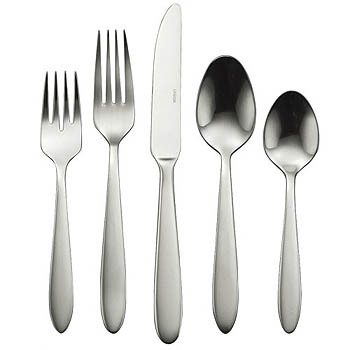 Made of 18/10 stainless steel that is dishwasher safe (word is that the gold accents hold up well) it includes a place fork, place knife, place spoon, salad fork and teaspoon. Normally I would save this posting for around Christmas time as it contains the most wonderful ideas for gifts. But you know, gift giving can be anytime of year. “Cutlery Commission” has taken the simple idea of stamping letters into cutlery and turned them into creative personal gifts or items for the home. The bottle opener shown above is one of my favorites and will surprise the beer connoisseur in your family when they sit down to find it at their place setting for the first time. The cutlery used is silver plated brass and should hold up quite well. Hand crafted and unique for you, so don’t go throwing it in the dishwasher please, wash by hand. All sorts of spoons, knives and forks can be created. BTW – Being a bit of a champagne snob, please don’t believe that a spoon in the bottle keeps the bubbles fresh. It’s an old wives’ tale. Looks at these handles. Just look at them. It’s not often cutlery goes for an unusual texture (other than horn) on the handles. I have to say that this is some stylistic risk taking by Oneida’s Italian designer. And it would be on your part as well to fit your table layout. But in my opinion it doesn’t go too far out there to be off-putting or too wacky. This 45 piece set is a service for 8 and the standard 18/0 stainless dishwasher safe steel. Oneida is a major player in this game and there is no questioning it. Their history goes back to the 1880s with a interesting connection to the movement known as Perfectionism. 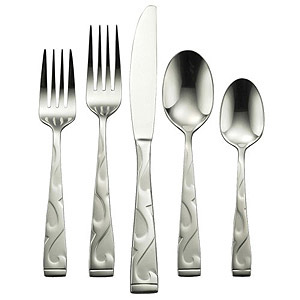 The Mooncrest flatware set is actually a 18/0 stainless (contains no nickel) and dishwasher safe. It has a nice extended set that includes a serving spoon, pierced serving spoon, meat fork, butter knife, and sugar spoon. 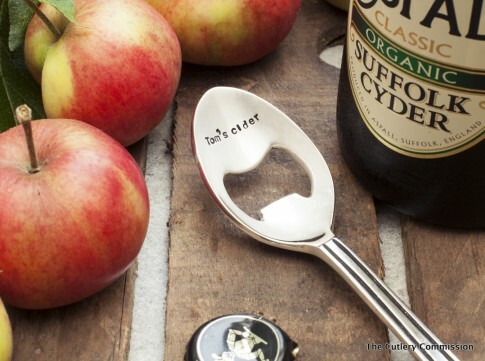 What is a pierced serving spoon you ask? Why it is a holey spoon of course.